This fresco depicts the assumpti&ogravzzz;n of the Virgin Mary into heaven. According to the Catholic Church, she travels to heaven with body and soul united, having been given this gift by God and fulfilling the promise of Jesus. Mary, "having completed the course of her earthly life, was assumed body and soul into heavenly glory." Debate has persisted over the years in the Catholic Church regarding whether or not Mary actually experienced death before being assumed into heaven. This debate has led to controversy surrounding the exact artistic depiction of her the death. 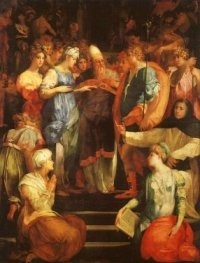 The moment of Assumption itself however has always been an extremely popular topic, particularly during the Renaissance. Artists such as Michelangelo helped form the realism that was apparent in this composition of Fiorentino's. 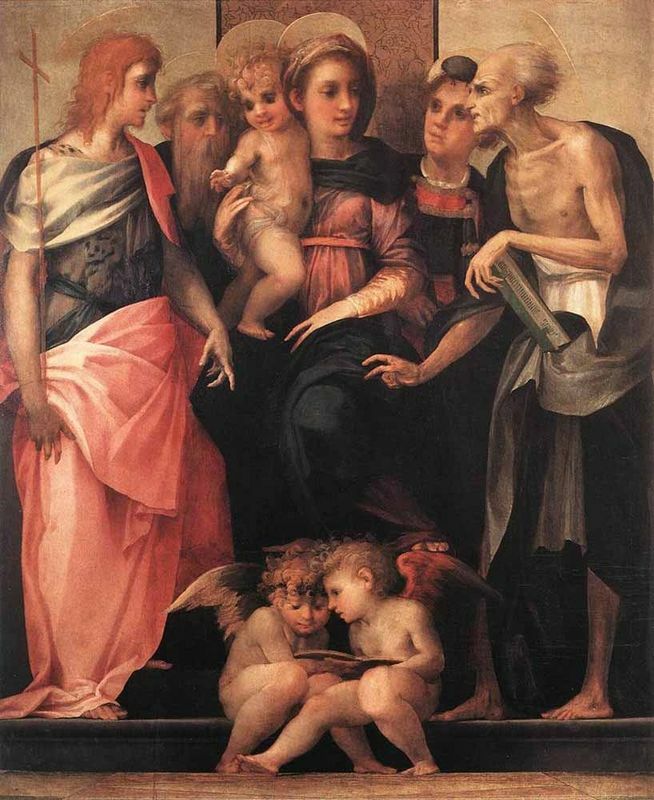 In addition, one can see the influence of Andrea del Sarto, his mentor at the time of this painting, who utilized a similar color palette and compositional sense, though Fiorentino of course took it to more unnatural and stylized extremes. Fiorentino, in his rejection of Renaissance ideals of harmony and typical standards of beauty, was trying to create a new way of looking at art. He was interested more in the stylized possibilities of composition that forced the viewer to think in a more sophisticated manner, and focused on the raw emotion that could be achieved in this way. The Assumption of the Virgin was Fiorentino's first major work and was commissioned for the monks at the Basilica of the Santissima Annunziata in Florence. This Assumption piece was a complete departure from Renaissance works that had been popular up until this time. The scene is split into two clear halves - the upper and lower sections divided by a swathe of gray space. 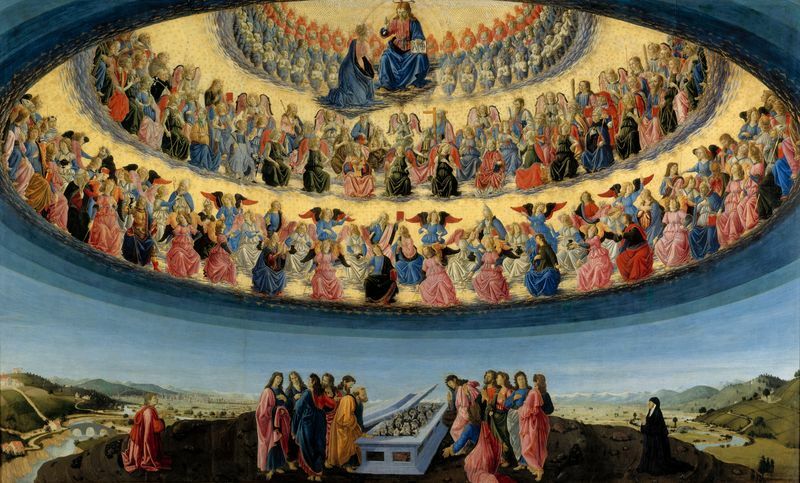 The figures in the lower half are posed stiffly, all sightlines directed upwards towards the upper center point of the painting in which the Virgin Mary resides in her ascension to heaven. 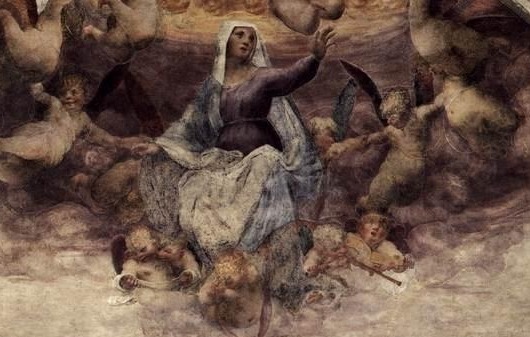 The upper half of the painting is also focused around Mary, surrounded by angels and frothy swirls of movement that lends the illusion of upward ascension. 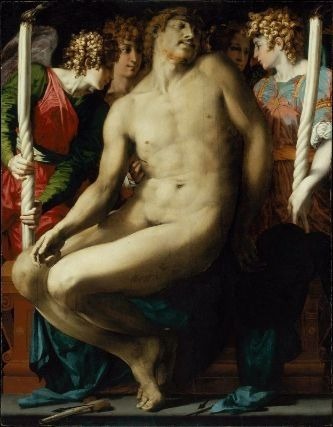 The chief aspect of this painting that was original at the time is the angularity of the figures which was a change from the hyperrealism of artists such as Michelangelo who believed in sculpted muscles and perfect anatomy. The characters in the foreground are posed in stiff, somewhat unnatural positions typical of early Mannerism. Fiorentino's trademark during this time is capturing figures in a freeze-frame moment, so while appearing completely stiff there is the implication of activity. 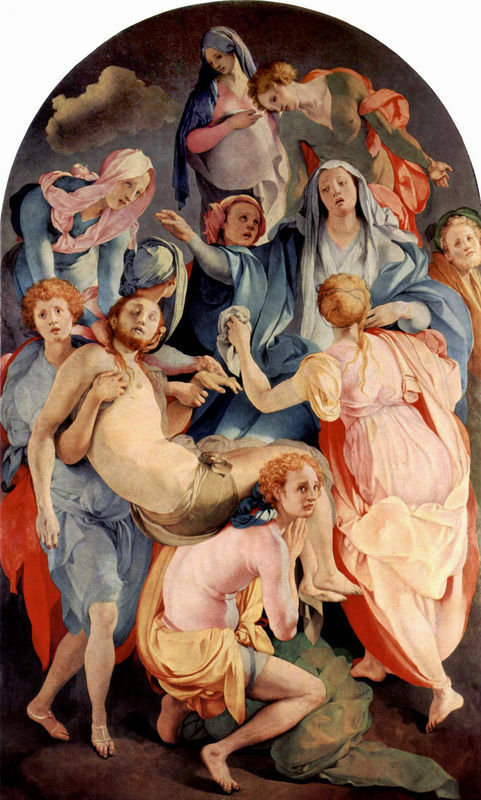 The color scheme also varies from other versions of The Assumption of the Virgin. The tones are muted, dark, dingy and displeasing to the eye. Mary is encircled in darkness from above, her face in shadow rather than illuminated. 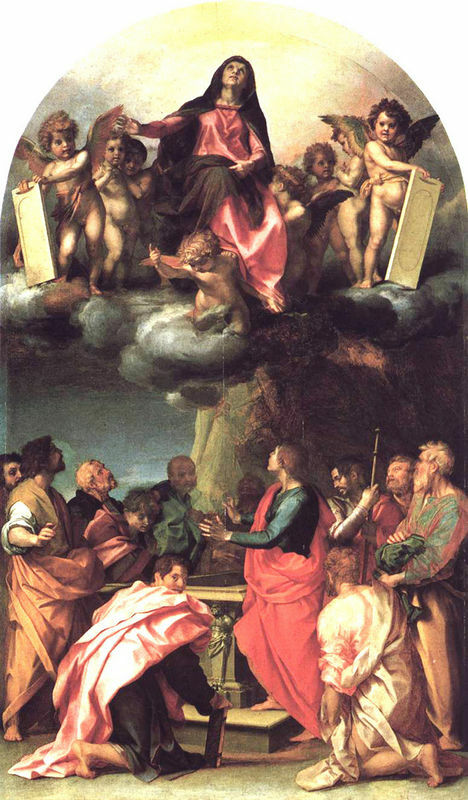 A popular subject for artists throughout history, The Assumption of the Virgin has been depicted in numerous renditions. Particularly during the time period that Fiorentino was entering, religious subject matter was prevalent and this biblical occurrence was one of the more celebrated inspirations. 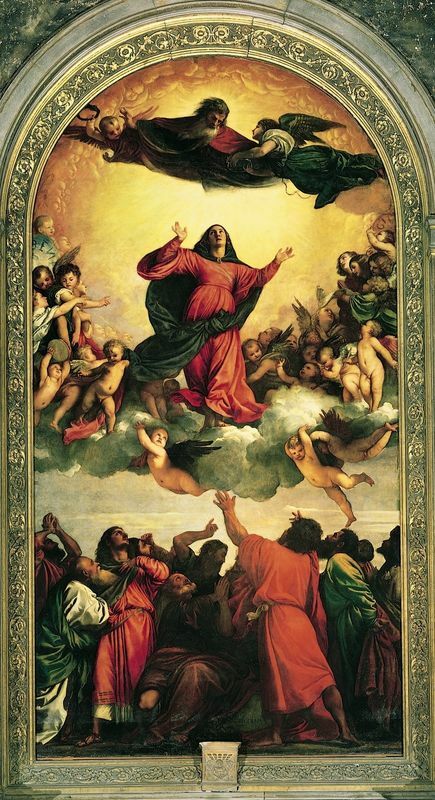 Titian's version of the Assumption is located in the Basilica of Santa Maria Gloriosa dei Frari in Venice, and is believed to be the largest altarpiece in the city. Bathed in warm golden tones, this painting is broken up into three layers: the Apostles at the bottom, Mary in the middle in the act of ascension, arms stretched up heavenwards, and God at the top who is waiting for her. Like Fiorentino's Assumption, this was Titian's first commission and was wildly popular when unveiled, establishing his popularity in Venice as a young painter. 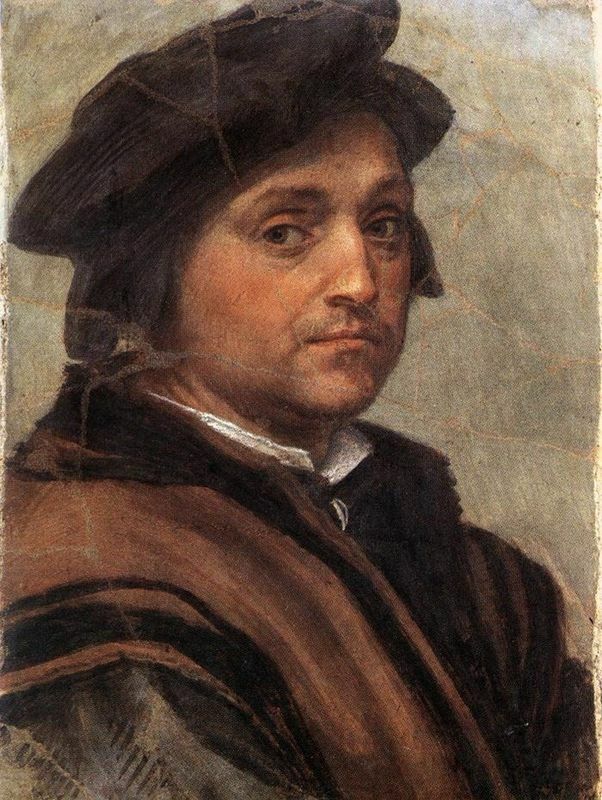 Andrea del Sarto also covered this theme, during a similar time period. His Mary is seen in a serene position of prayer as she is airlifted by cherubs away from the darkness of earth and up to the celestial delights of heaven. The crowd below seems somewhat bemused and the distinction between heaven and earth has never been clearer with the difference in tones and expressions. In the middle is a swath of darkness that divides the two. The Assumption of the Virgin was the first major work created by Rosso Fiorentino during his formative years in Andrea Del Sarto's workshop. It made a bold statement at the time and marked the arrival of not only a brash new talent but a new movement, Mannerism. Fiorentino was an artist with a completely unique way of seeing the world and his talent and foresight was undeniable. For a contemporary audience used to the harmonious works of the Renaissance, however, Fioretino's The Assumption of the Virgin was not particularly well received. It was criticized for its odd use of perspective, displeasing aspects and psychologically distressing use of clashing colors. 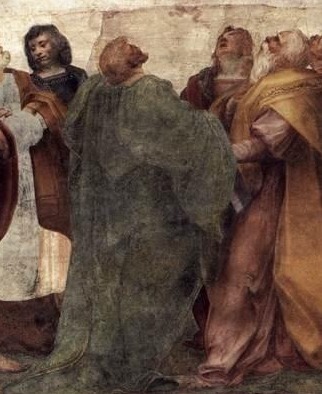 The friars of the Basilica of the Santissima Annunziata were apparently so unhappy with the work that they asked Andrea del Sarto to repaint it. Although Fiorentino he was derided by art critics for centuries, he has in modern years finally garnered the accolades he deserves along with the recognition as a rebel before his time. The artist was unafraid to take conventions established by the Renaissance and turn them upside down, linking him with maverick talents of the modern era, from Surrealists to Abstract Expressionists. After the idealism and perfectionism of the Renaissance, artists were eager to branch out and stretch the forms of artistic license during a turbulent time in Italy's history. 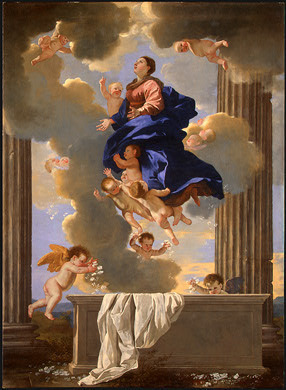 The Assumption of the Virgin is a prime example of this new form of artistic expansion, which was to be called Mannerism. Noted for its sophisticated, intellectual, and artificial qualities, The Assumption of the Virgin fits right into the Mannerist mold and was influential for artists up until the late 16th century when the Baroque movement took hold.